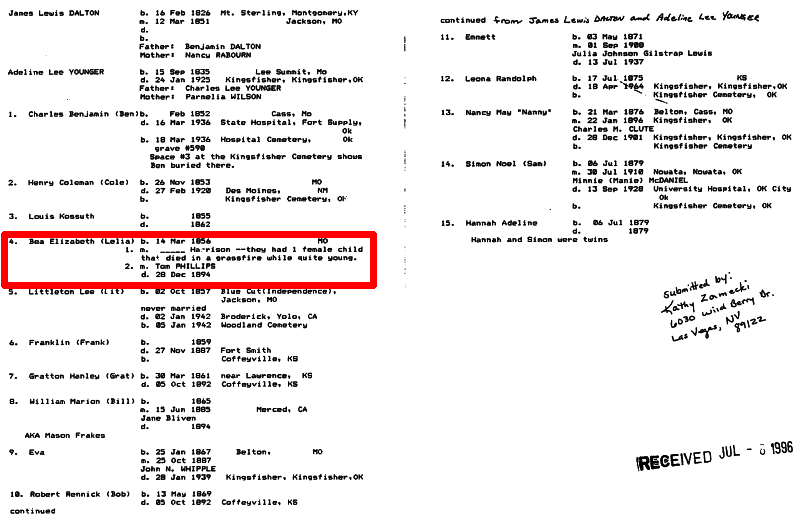 Here find a chronological listing of the evidence – both favorable or unfavorable – to the proposition that Bea Elizabeth (or Beatrice), last name unknown, who married Tom Phillips is or is not the daughter of James Lewis Dalton and Adeline Lee Younger. Some information is unique to this page but most is also shown elsewhere in different contexts in this exposé of the Bea Elizabeth Dalton Hoax. There is so much evidence that it isn't practical to show it all on one page. A complete listing of all the evidence can be seen in the Evidence Locker. 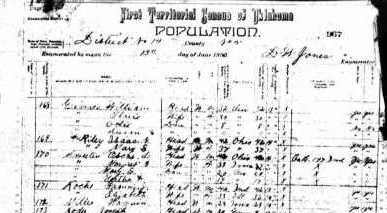 No census record has been found for the family of James and Adeline Dalton in 1860. Source: Frank Latta, Dalton Gang Days, 2001, p. 4. Tom Phillips is enumerated with his parents, George & Eliza Phillips, in Kerrville, Kerr County, Texas. Bea Elizabeth is not found anywhere, with any last name. 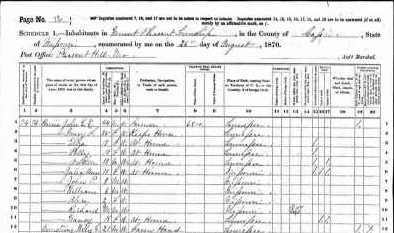 Sometime before the enumeration of the June 21st, 1870 census in Kerrville, Kerr County, Texas, Tom Phillips' mother, Eliza Fox Phillips dies. This is important because she could not have made the Bible entries about Tom and his wife B. Elizabeth. 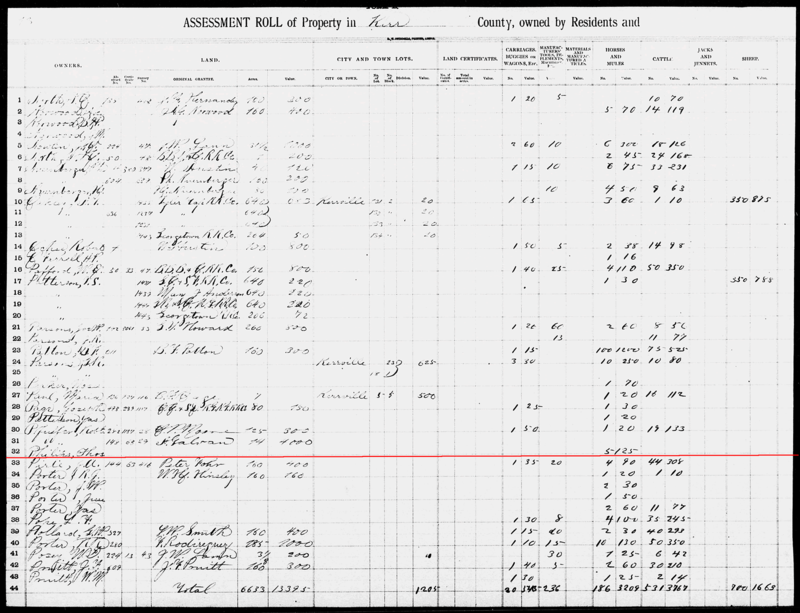 The 1870 U.S. census of Mount Pleasant Township, Cass County, Missouri taken August 26th lists the family of James Lewis Dalton and his wife Adeline Lee Younger. No one named Bea, Beatrice or Elizabeth is present (were she a member of the family, she would be 14 years old). Lelia also is not present as she died in infancy (she would have been about 12 years old). 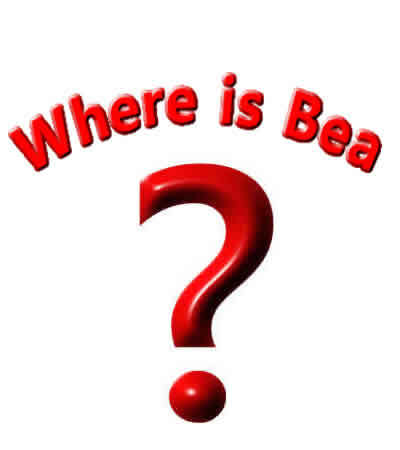 Where is Bea Elizabeth (whatever her last name was)? It is alleged that, sometime in this period, Bea Elizabeth married a HARRISON, had a daughter who died young in a fire, and then later married Tom PHILLIPS. The HARRISON marriage appears to have been concocted to explain her absence from the censuses, as there is NO EVIDENCE WHATSOEVER of such a union or of any progeny from it. 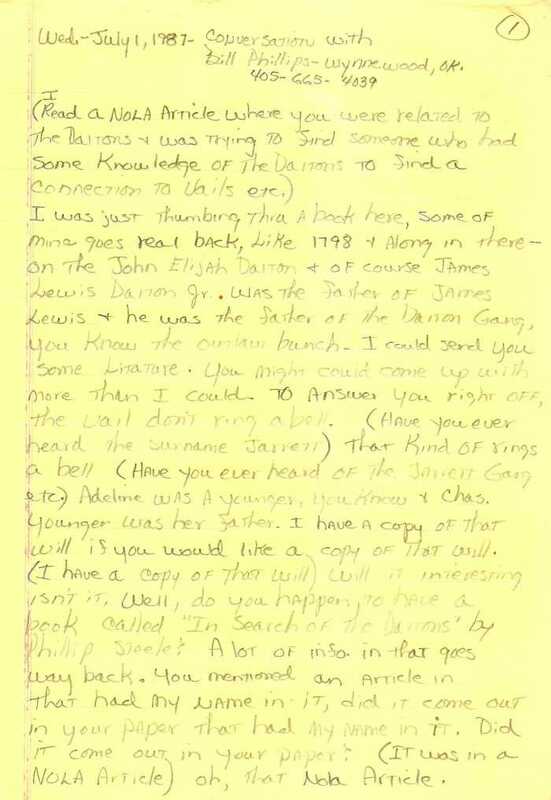 Nothing about anything HARRISON is mentioned in the "Bible record" of Tom Phillips' father. All evidence of that comes from the marriage records shown further below (e.g. 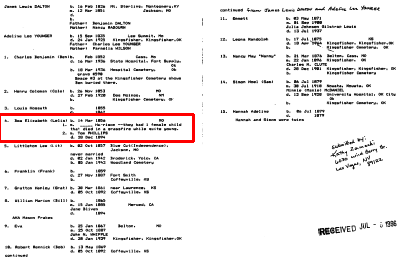 the Broderbund Family Archives and the FGS and gedcoms submitted to the ancestry.com "U.S. and International Marriage Records, 1560-1900") and the origin of that information was undoubtedly the same person responsible for the rest of the fraud presented here. This appears to be a fictitious marriage dreamed up to explain why the death records of two of her sons list her maiden name as HARRISON. But it really doesn't matter, since she is not related to the Dalton family and whatever marriages or children she had are of no interest to the Dalton researcher. 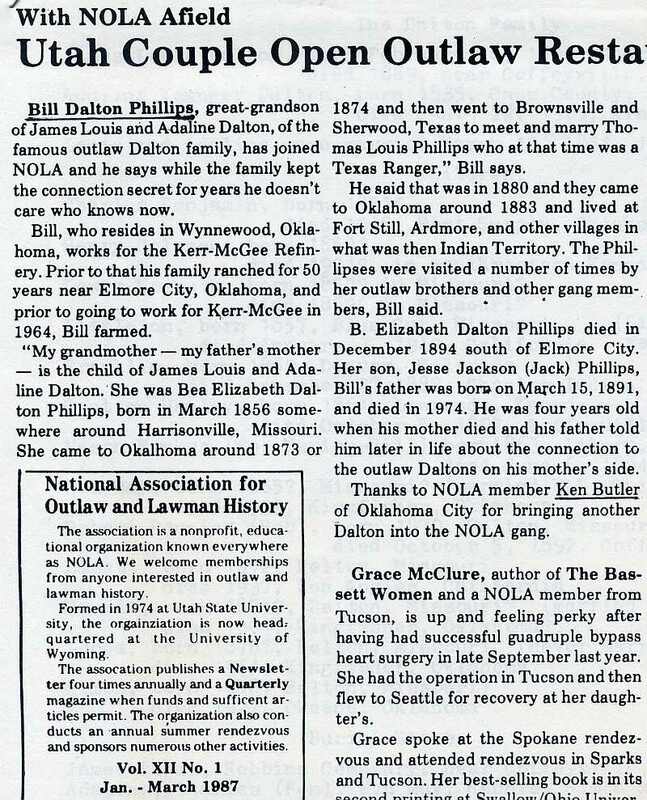 The hoaxster, "Bill Dalton Phillips", in his 1987 NOLA article, alleges his grandmother "came to Okalhoma (sic) around 1873 or 1874..."
No one by that name is with the Dalton family in 1870 so, if she were a member of the family, she would have left home in Missouri to travel into Indian Territory at the young age of thirteen. 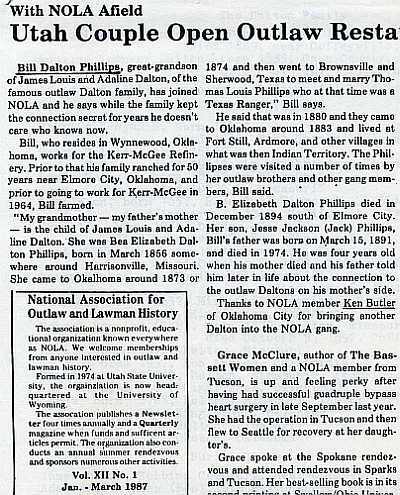 Bill "Dalton" Phillips writes in his NOLA article that his grandmother Bea Elizabeth "Dalton" met and married Tom Phillips in Brownsville and Sherwood, Texas (confusing, but as quoted from his article). 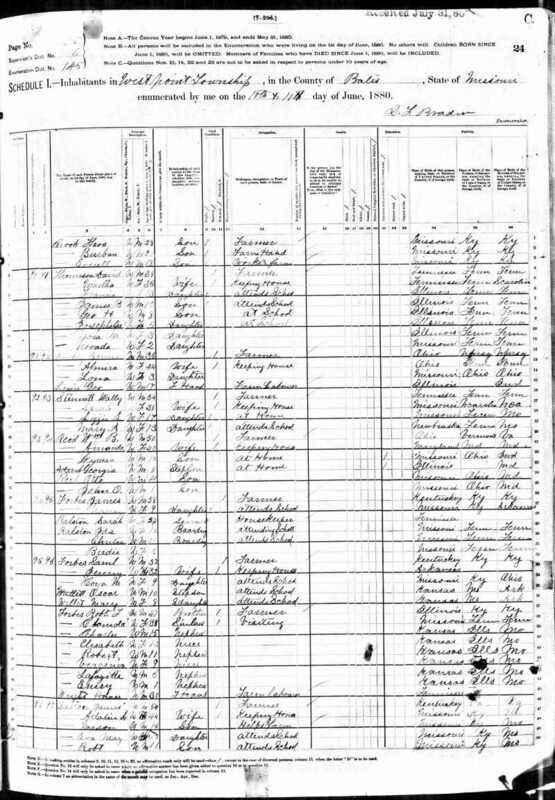 The 1880 U.S. census of West Point, Bates County, Missouri taken June 11th lists the family of James Lewis Dalton and his wife Adeline Lee Younger. No one named Bea, Beatrice or Elizabeth is present (she would not marry Tom Phillips for another two years, if the marriage date we have is correct, and she ought to be with her family). Lelia also is not present as she died in infancy. Bill "Dalton" Phillips writes in his NOLA article "they came to Oklahoma around 1883 and lived at Fort Still" (sic), Ardmore, and other villages in Indian Territory. Tom & Bea Elizabeth Phillips had their first child in Kerrville, Texas in 1882 and their second in 1884, so one must wonder why, or if, they would have made the 360 mile round trip from Kerrville into Indian Territory and back within that time span. It is possible they could have traveled between Kerrville and Fort Sill between births of their children, but there was no train or stagecoach service available in their area, so they would have had to travel by horseback or wagon. A wagon pulled by oxen might make the trip in a month whereas a team of horses pulling a wagon could make it in a few days. Considering they had infant children, it's doubtful they walked or rode horses. 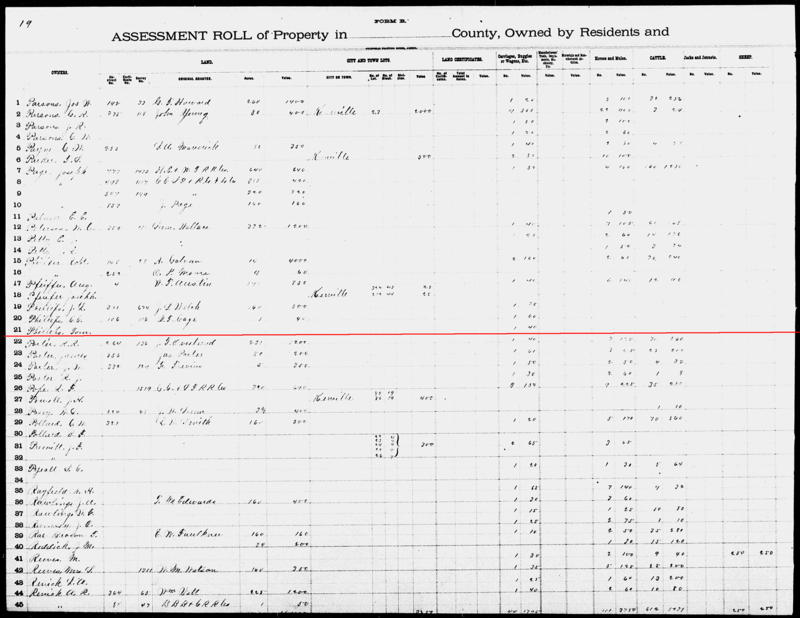 Unfortunately for the imaginative and ever resourceful hoaxster, his grandparents were having children in Kerrville between 1882 and 1890 and his grandfather was assessed taxes on Kerr County property in 1881, 1882, 1883 and 1885. Tom Phillips on Kerr County, Texas tax rolls. Alford Lee Phillips was born in January, 1884 in Texas, probably Kerrville. He died in 1931 in Loco, Oklahoma, before the social security act was passed, so we have no social security application for him. If you're trying to follow this convoluted tale, bear in mind that it's likely the fraudster never expected anyone to check his claims. Bea Elizabeth left home around 1870, at 13, to go to Indian Territory while her family stayed in Missouri. She was in Texas in 1880 to marry Tom Phillips (she would have been 23 or 24). She had her first child in Kerrville, TX in 1882. She and Tom moved to Fort Sill, Indian Territory around 1883 – 360 miles north of Kerrville. She and Tom were back in Kerrville by 1884 in time for her to deliver her second child. 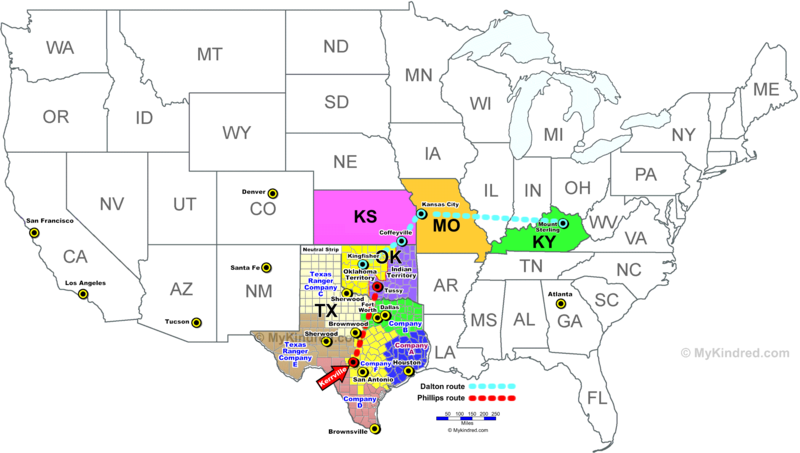 The Oklahoma Land Run of 1889 began April 22 in Guthrie, Oklahoma Territory and opened up the Unassigned lands to white settlers. Benjamin Harrison was president of the United States, and the Land Run made approximately two million acres available to approximately 50,000 people. The city of Guthrie, which had been established two years earlier, became the capital of the Territory and the city of Kingfisher was established after the Land Run. This is useful in understanding the events surrounding the family of Adeline Dalton. 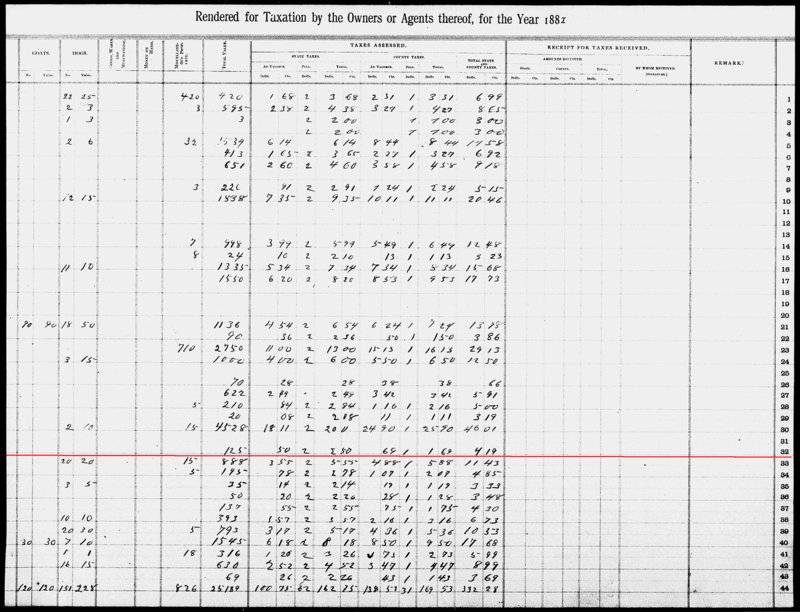 It's not known exactly when Adeline arrived in the Territory, but she is alone, as Head of Household, with her children on the June 1890 Territorial Census. James was seldom around, so it isn't unusual for him to not be enumerated on the census with her. According to her obituary, he died the next month near Coffeyville, Kansas. All but one of their children were born near Kansas City, Missouri, the other being born in Kansas. 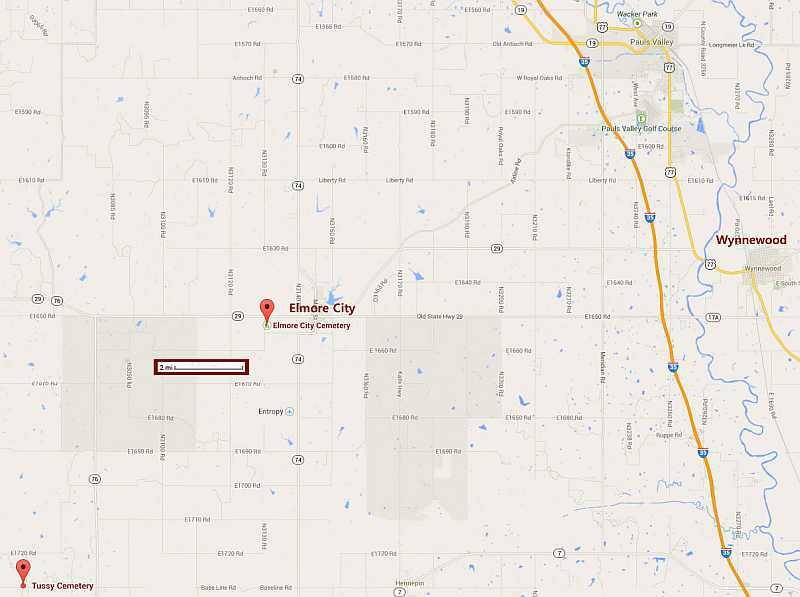 According to Adeline's obituary, her husband died near Coffeyville, Kansas. She settled on a farm north of Kingfisher. The map shows the proven travel routes of both the Dalton family and the Phillips family. Bill's fanciful genealogy alleges his grandmother was born in Missouri and traveled to Indian Territory and then to Texas to meet Tom Phillips while in her early twenties. All the evidence shows that Bea was born in Texas, probably Kerr County. The cities of Brownsville, Brownwood and Sherwood are on the map to show the places Bill says his grandfather, Tom Phillips, was in. It also shows the Texas Ranger divisions to allow for examination of his claim that Tom was a Texas Ranger. 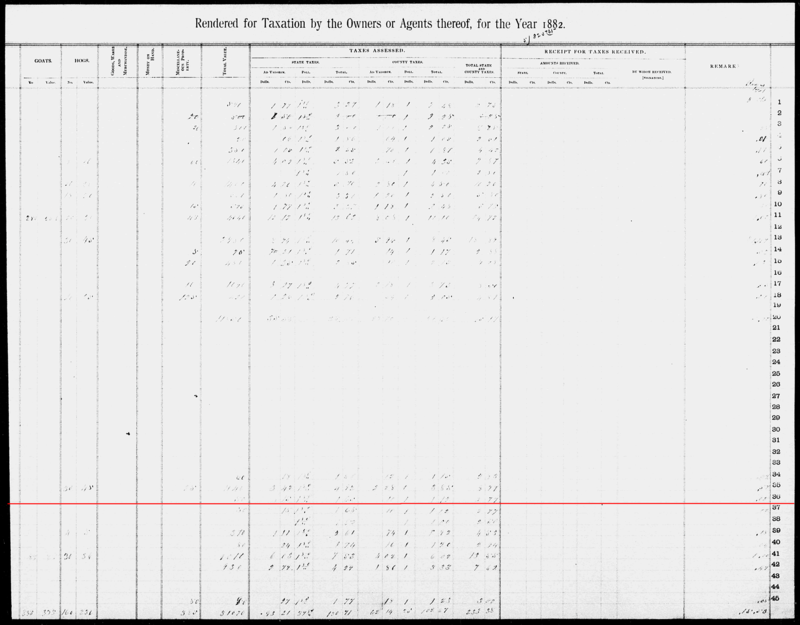 The 1890 Oklahoma Territorial census taken at Kingfisher, Indian Territory on June 13th lists the family of Adeline Lee Younger Dalton (her husband having died on the trip from Kansas). Jack Phillips was born in March of 1890 in Kerrville, Texas. 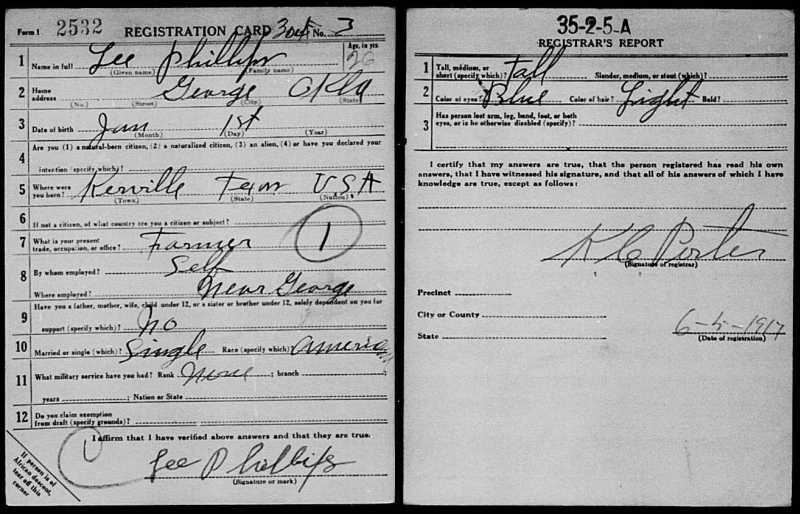 He gives Kerrville as his place of birth on his WW-I draft registration and on his social security application of 1939 where he gives his mother's name as Edna Dawlton, but he also lists his birth year on that document as 1895. 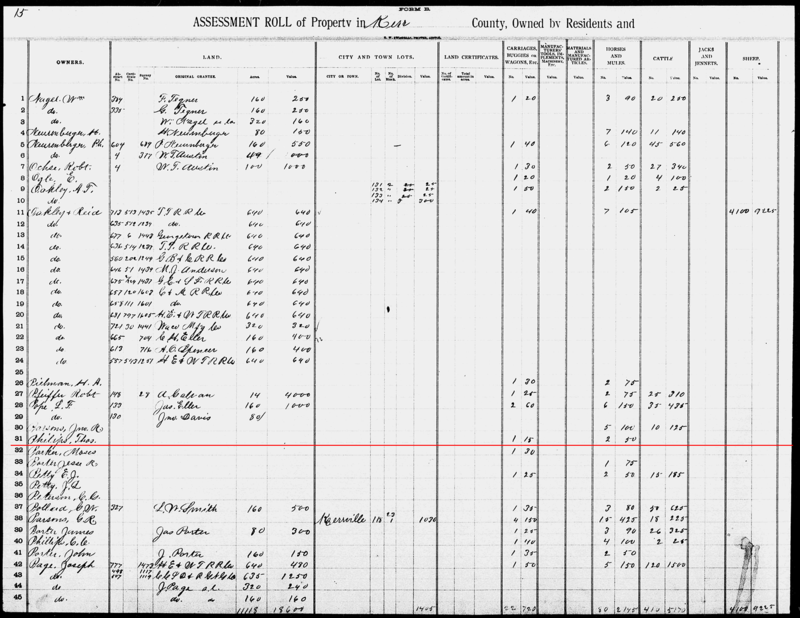 He is listed on 1900 census with his father and siblings as being 10 years old along with his twin sister Pearl, so it's obvious he wasn't born in 1895. He didn't know his mother's given name so how can the surname he gives for her be considered accurate? Bill Phillips wrote in his NOLA fairy tale that his family went to Indian Territory about 1883 but all the children – his aunts and uncles and his father Jack – were born in Texas from 1882 through 1890. George Phillips, Tom Phillips' father and Bea's father-in-law, died in March of 1894 in Kerrville, TX. This is important because it makes it unlikely he made the Bible entries about Tom and his wife B. Elizabeth. Kerrville, Tex., March 6. -- Mr. G.P. PHILLIPS, an old veteran and prominent citizen of this place, died a few days since. 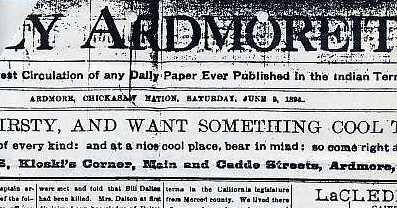 Three days later, the June 9th edition of the Ardmore Daily Ardmorite printed an interview with Bill's wife, Jane Bliven Dalton. In that interview she named all of Bill's siblings. She did not mention a Bea, Elizabeth or Beatrice, who was alive at that time. She also did not mention Lelia as she had died some forty years earlier. She did not mention any relative named Phillips. Were she related, you'd think she would have mentioned Bea Elizabeth Phillips who was living nearby and had children who would be her nieces and nephews. See the page The Newspaper Fraud to see the fraud committed with this newspaper article in an attempt to prove that Bea Elizabeth Phillips was his sister. Six months after Bill Dalton died, it is alleged that Mrs. Bea Elizabeth Phillips died December 28, 1894 in Garvin County, Indian Territory, but is that true? 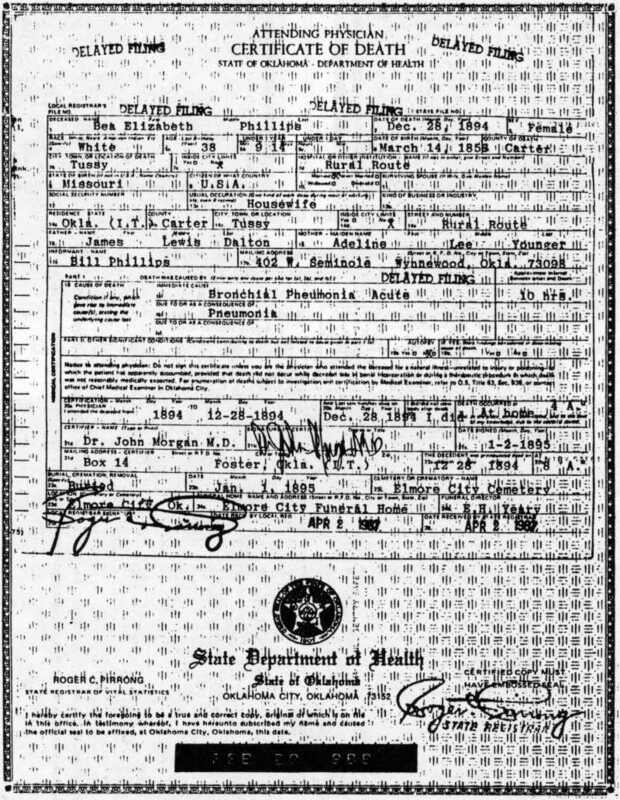 All her children were born in Texas: see finding Bea and her youngest child's social security application. Perhaps Bea Phillips died in Kerrville, Texas and her family moved to Indian Territory following her death. No death certificate has been found for her as there were none in Oklahoma prior to 1908. When people died back then, they were often just buried and no official records were kept. Oklahoma began filing death records in October of 1908. It was not mandatory, however, that these records be filed until 1917. 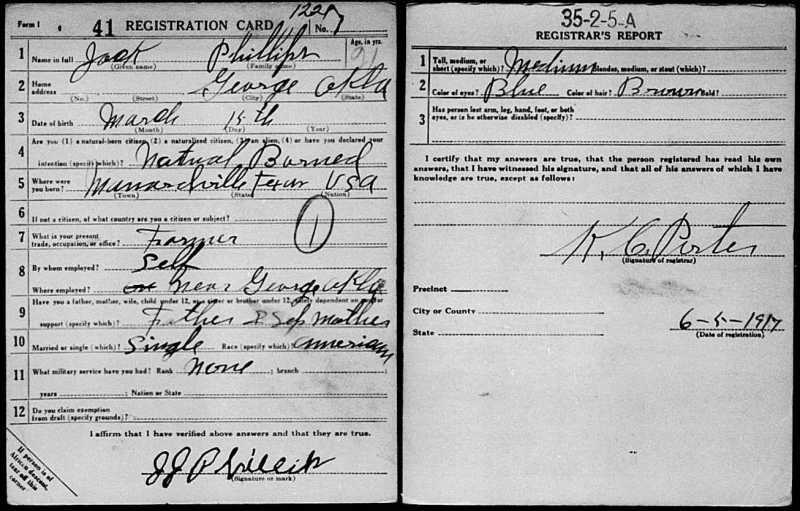 Because death records were not required for identification as they are today, not all records prior to 1940 were placed on file consistently. Wonder of wonders, in 1987, a modern death certificate appeared for her long after her death. It is said to be a "delayed filing" death certificate, but what would be the purpose? Why?. See the Forged Death Certificate page. Bea Elizabeth Phillips' body was allegedly buried at Tussy Cemetery, though no records exist for her burial, though an early cemetery survey indicated markers for both Tom and Bea Phillips. Her husband, Thomas Phillips, was buried there in 1930. The Tussy Cemetery was founded in 1893, and she would have been buried there the last week of December of the next year. 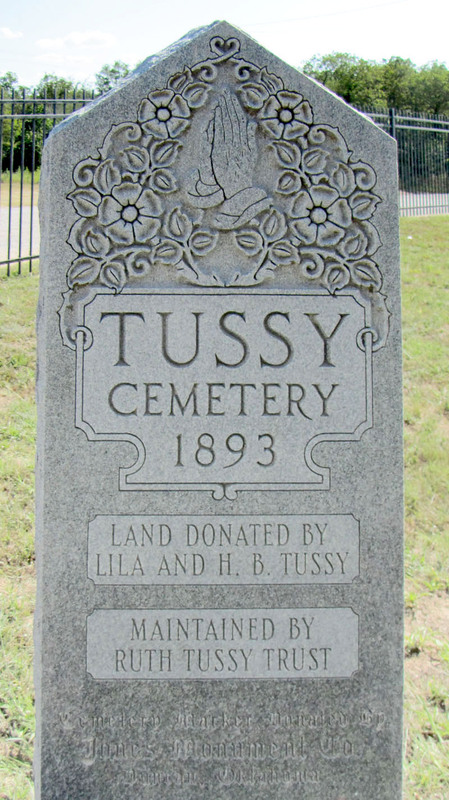 The family lived at Tussy, which is just East of the cemetery on the map below, but it is not known when they moved there. okgenweb.org | okcemeteries.net | findagrave.com. The okgenweb.org survey of February 2000 (link above) does not list the Phillips graves – see the next sentence. For some reason, tombstones were later placed in the Elmore City Cemetery for Tom and Bea Elizabeth Phillips – apparently sometime before July, 2004 (see Bill's letters of early 1988 saying he had replaced the tombstones). 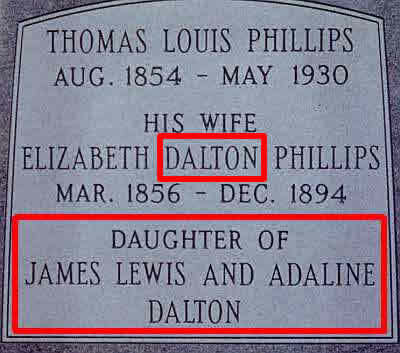 The new tombstones give her name as Elizabeth Dalton Phillips and list her parents as Lewis and Adaline Dalton. Thomas Phillips' parents are not listed. Why? 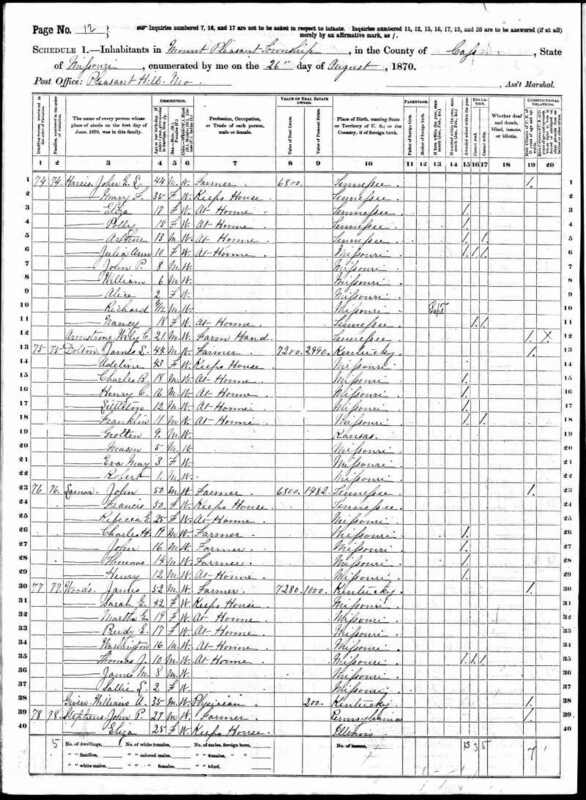 The 1900 U.S. census taken at Cimarron, Kingfisher County, Oklahoma on June 14th lists the widow Adeline Dalton and two of her children. The family of Tom Phillips (Bea having died) is living app. 50-75 miles south of the Daltons in the Chickasaw Nation. 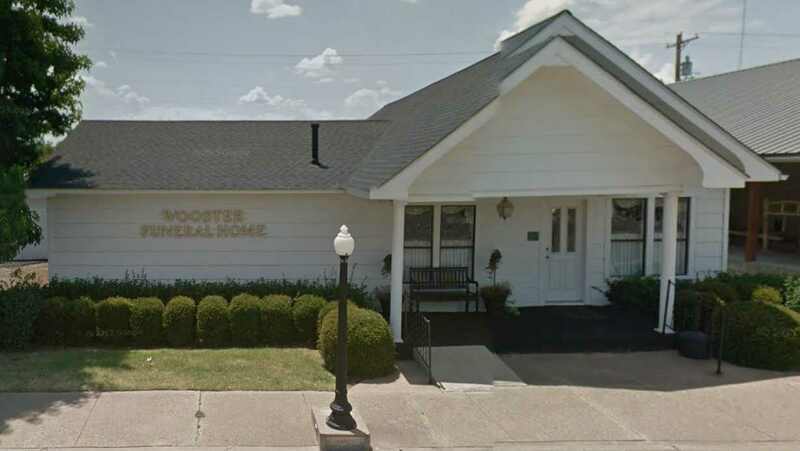 (The Yeary-Vaughn Funeral Home eventually became the Wooster Funeral Home, picture at right). World War I Draft Registrations. 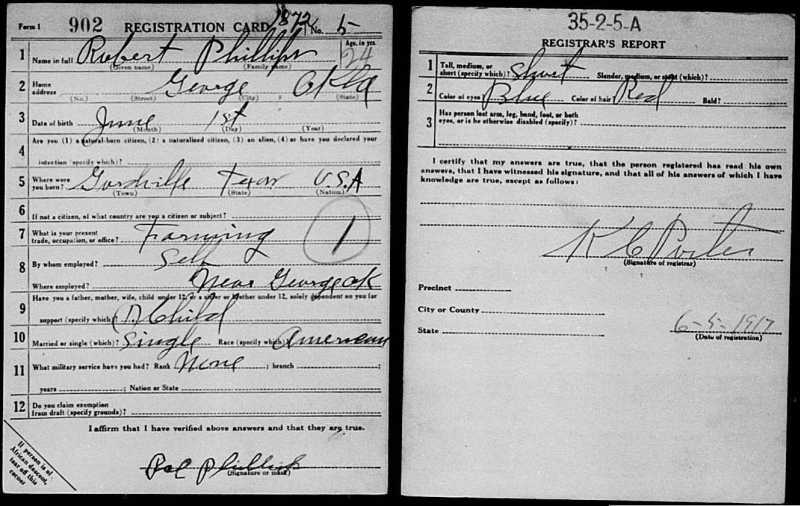 The Phillips men registered for the WW-I draft in 1917 and in 1918. 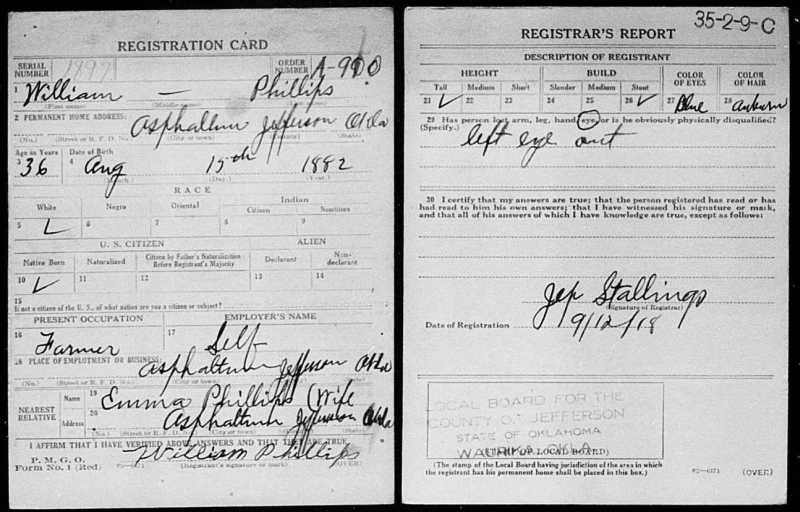 Lee (Alford), Robert & Jack Phillips all registered the same day, June 15, 1917, and each application was signed by the same man, K.C. Porter, implying they also registered at the same place, probably travelling together to do it. Lee Phillips seems to have been the best informed about his background, giving his birth place as Kerrville, TX, but he didn't give his birth year. Robert and Jack Phillips, however, could not accurately give their place of birth. Robert wrote "Gordville, Texas" and Jack wrote "Manarchville, Texas". 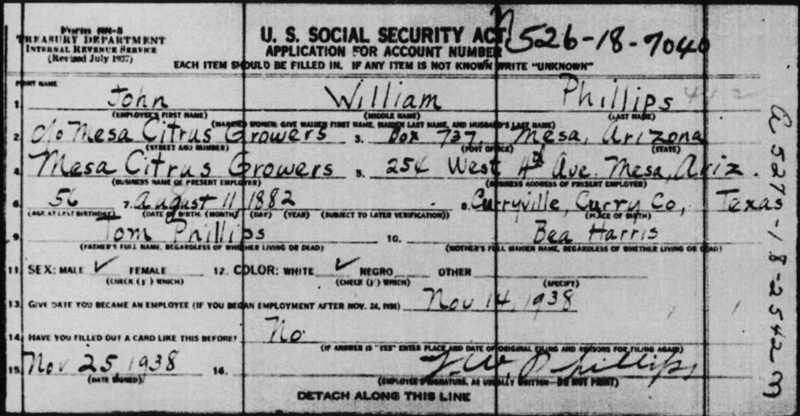 The oldest brother, John William Phillips, registered the next year, Sept. 12, 1918, and there were no questions on this version of the form about place of birth, but on his social security application in 1938, he gave his birth place as "Curryville, Curry County, Texas". As with the other primary evidence, it is obvious the Phillips children knew little of their mother or even where they were born. 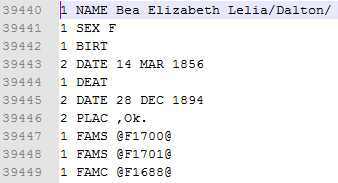 One wonders where the allegedly factual information about Bea Elizabeth's place of birth and first marriage to Harrison originated as there is no evidence her children knew anything about her. Emmett Dalton, son of James Lewis Dalton and Adeline Lee Younger, publishes his book "Beyond the Law". In it he lists the children in his family. 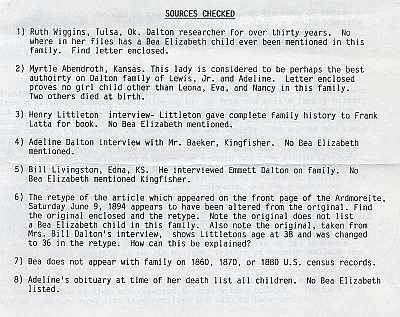 Two facts arise out of this: (1) there is no Bea or Elizabeth or Lizzie mentioned and (2) the daughter that he does mention and who is not otherwise accounted for, Lelia, has her name taken and appended to that of Bea Elizabeth Phillips such that she becomes "Bea Elizabeth (Lelia) Dalton". Unfortunately for the fraudster, the children are listed in chronological order and Lelia could not be Bea. Further, other researchers, with no axe to grind, allege that she died in infancy and one says she was another twin. On January 24, 1925 Adeline (Younger) Dalton died. Her obituary does not list a daughter named Bea, Elizabeth, Lizzie or Beatrice, nor does it mention any relative named Phillips. See the page The Altered Obituary to see the fraud committed with this newspaper article in an attempt to prove that Bea Elizabeth Phillips was her daughter. No source is given for the altered obituary, but it was probably based on the Jan. 29, 1925 issue of the Kingfisher Free Press and modified to suit the impostor's needs. As expected, the original does not list anyone named Bea Elizabeth nor does it mention anyone named PHILLIPS. Copies of the newspaper notices of her death are here. Some of them mention her infamous sons and the daughter with whom she was living when she died, but conspicuously absent is any mention of a Bea or Elizabeth or anyone surnamed PHILLIPS. Tom Phillips, widowed husband of Bea Phillips died and was buried at Tussy Cemetery, but he now has a tombstone at the Elmore City Cemetery. Why? 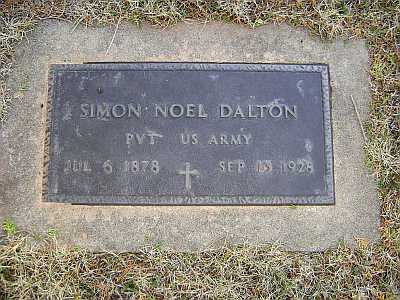 Emmett Dalton, a son of James and Adeline Dalton, died July 13, 1937. None of the newspaper articles about his death mention anyone named Bea or Elizabeth or any relative named Phillips. John William Phillips was born August, 1882 in Kerrville Texas. In November of 1938, he filed for his social security number. * There is no Curryville or a Curry county in Texas. 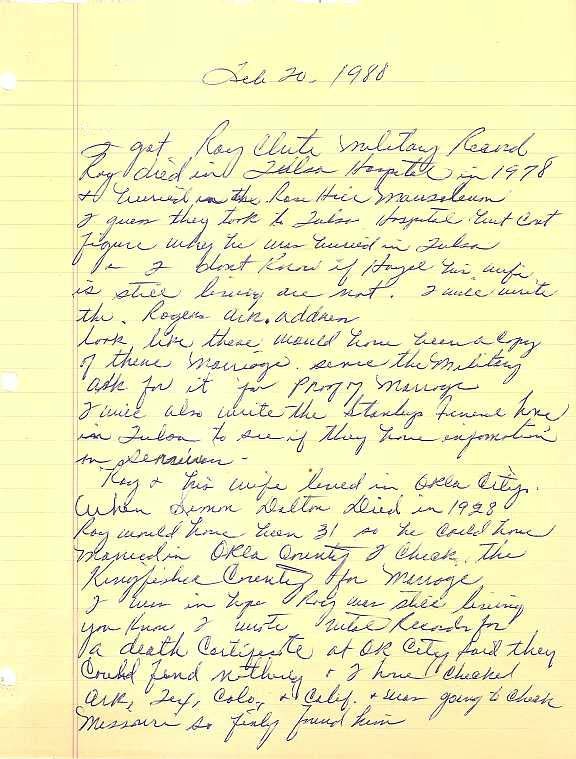 Either he or a transcriber misspelled Kerrville and Kerr County. 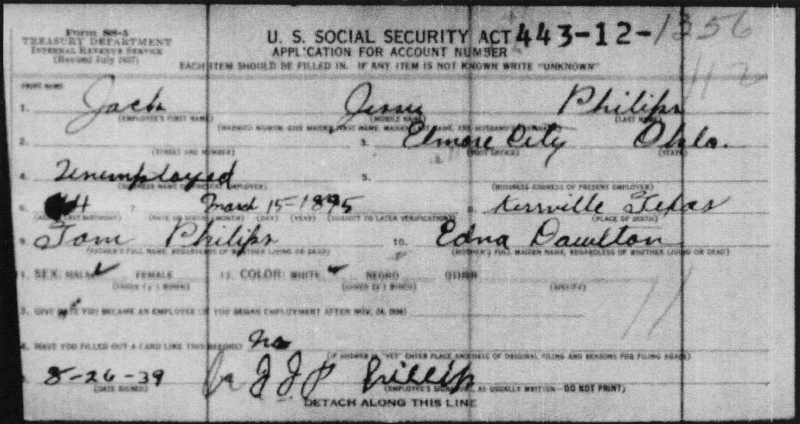 Jack Jessie Phillips applied for a social security card in August of 1939 when he was 44 years old (he was actually 49 years old, having been born in 1890, not 1895). He gave his mother's name as "Edna Dawlton", but Bea Elizabeth Phillips was his mother. He also listed his place of birth as Kerrville, Texas, which could make one wonder but what Bea Phillips actually died in Texas rather than Indian Territory. 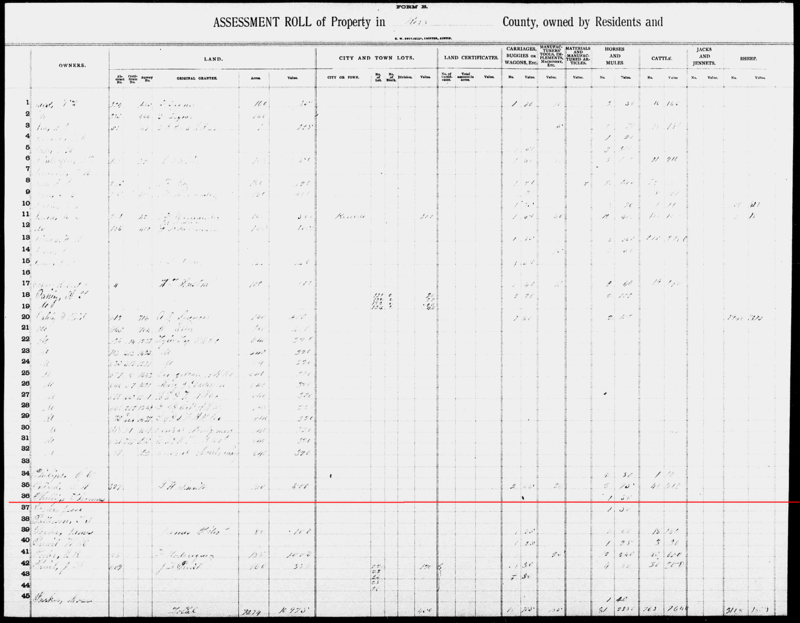 On the 1900 census he is 10 years old and his birth date is March 1890, but on the 1920 census he is 26, implying a birth date of 1894 or 1895. In 1910 he is 18 and in 1930 he is 38, both implying a birth date of 1892 and in 1940 he is 47 implying a birth date of 1893. The data on this family seems to vary quite a bit and it is hard to know what to believe. This is placed in the "Trusted" category because Bill Phillips could not have altered it. 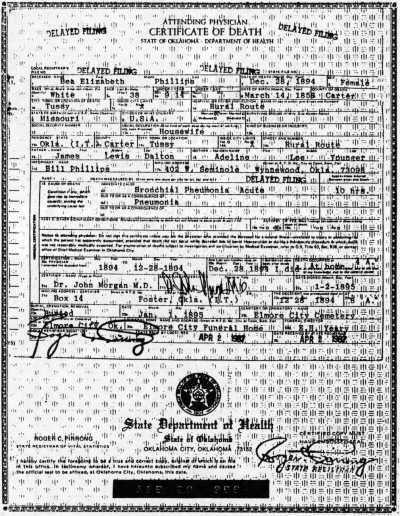 Important to this researcher is the fact that Bea Elizabeth Phillips died when Jack Phillips was an infant or, if this document is to be believed, she died before he was born and someone else was his mother. She had been dead 44 years when he made this application and it doesn't look like he was very certain about her identity, so a category of "Questionable" might be in order. 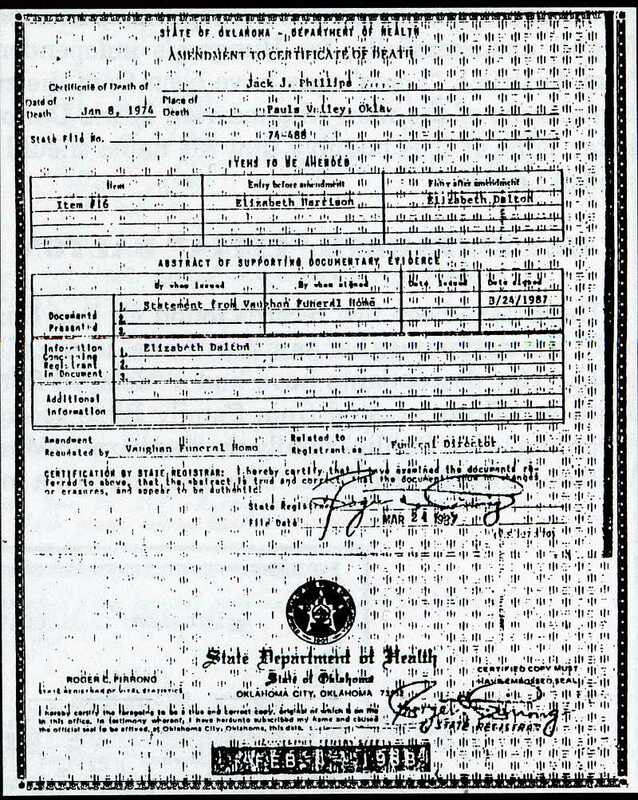 On his death certificate, his mother is listed as HARRISON, her birth place unknown. Leona Dalton died April 20, 1964 in Kingfisher, OK. Is it any surprise that her obituary makes no mention of anyone named Bea, Beatrice or Elizabeth or any relative named Phillips? The Phillips family "researcher" wasn't satisfied with this and created a "Memorial Obituary" correcting the unfortunate omission. Leona outlived all of her brothers and sisters. She died in the Huskille Rest Home in Kingfisher, OK on 18 Apr 1964 at the age of 88 years. Leona came to Kingfisher Indian Territory with her folks in a covered wagon as a teenager in 1890. She had been a member of the First Christian Church since 1902 and it was from there that the burial services were held. 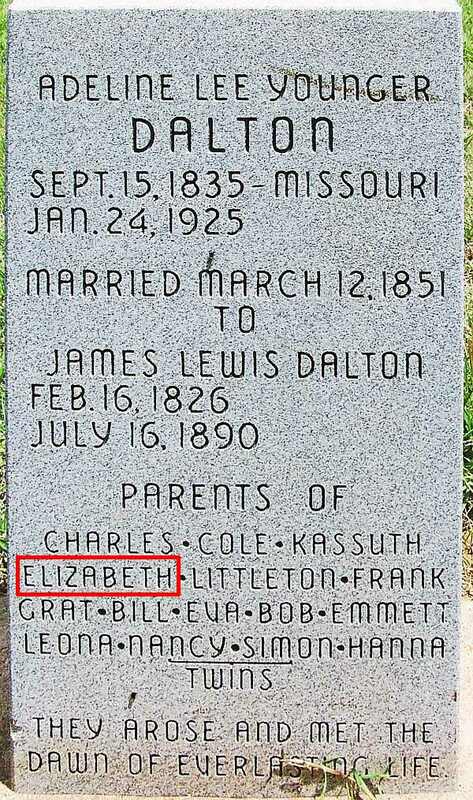 She was buried in the Dalton family plot in Kingfisher, OK. Her survivors were her nephews; Roy Clute, Charles Coleman Dalton and Jack Phillips. A delayed social security application was filed three years after he died by his wife Martha. It gives his father's name as Tom Phillips, his mother's name as Vic Phillips and his birthplace as Kerrville, Tex. Note the two social security numbers and his birth date is 8-16-1883, different from his original application. Jack Phillips died Jan. 1974 and was buried in the Elmore Cemetery by the Vaughn Funeral Home in Elmore City. 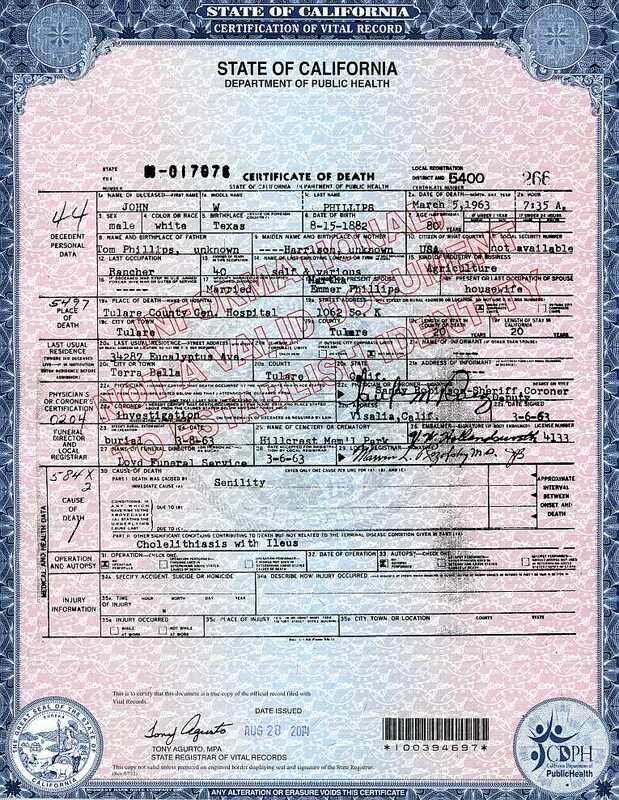 The funeral director recorded his mother's maiden name as HARRISON (Mrs. Phillips paid for the funeral) and that is also on his death certificate, with his wife Annie as the informant. He was the father of the man who has committed most or all of the fraud and who filed for the amended death certificate in 1987. 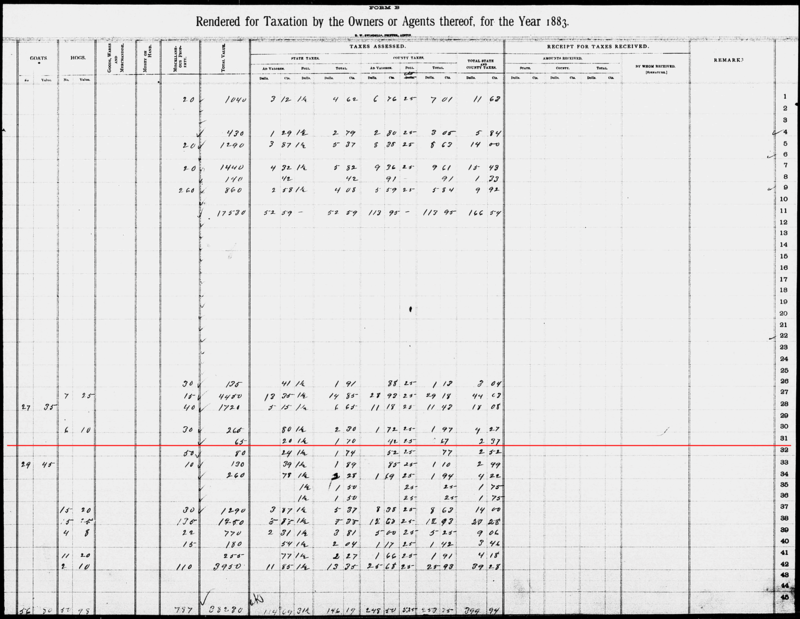 William Yates, a professional genealogist, began his valuable Family Group Sheet Exchange at Yates Publishing which consists of over 200,000 pages of family group sheets. 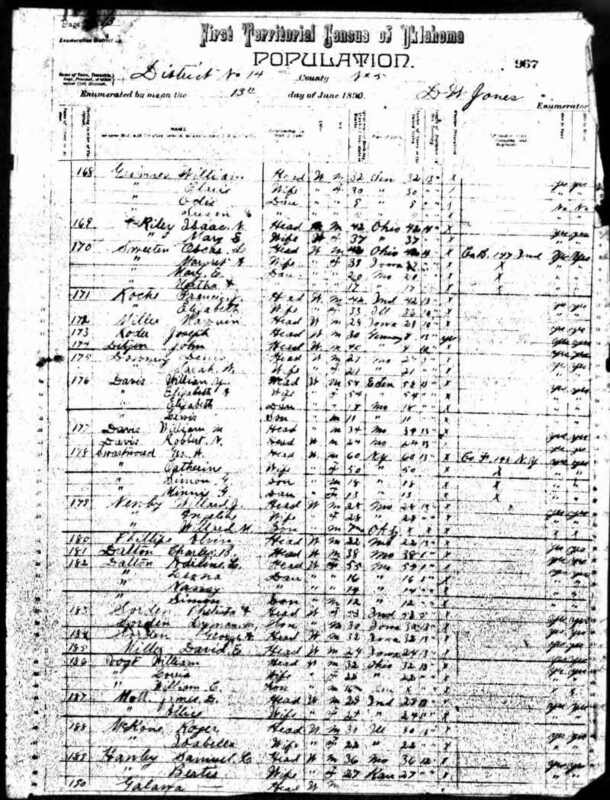 This collection of family group sheets and gedcoms, some of which he assembled himself and others that were sent to him by other people, are part of what is used to generate the "U.S. and International Marriage Records, 1560-1900" index on ancestry.com. Not all the information is sourced and the researcher is encouraged to verify anything they find there. 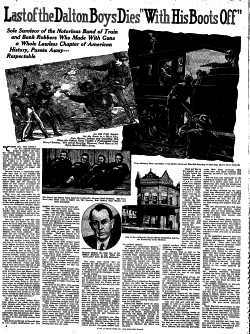 In March 1987 the National Association for Outlaw and Lawmen History (NOLA) published an almost completely fictional article by Bill Dalton Phillips describing his relation to the Dalton Gang and how they and other outlaws visited the home of his grandparents. Now Bill Phillips' grandmother's maiden name is "officially" DALTON. Delayed Filing Death Certificate — from 1894? A "Delayed Filing" death certificate was filed for Bea Elizabeth Phillips. 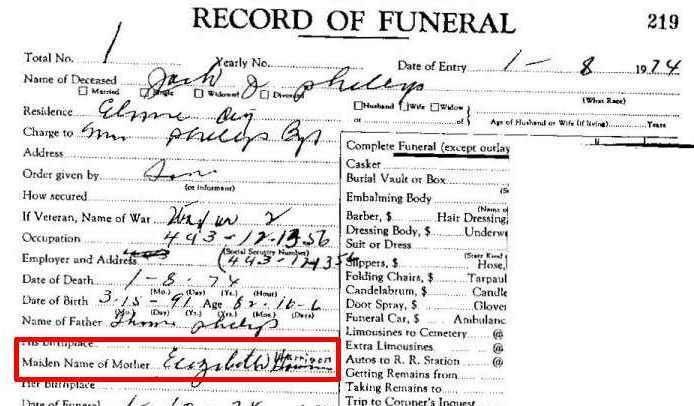 She died in 1894, no death certificates were filed in Oklahoma before 1908, there was no funeral home, no funeral records. The informant is Bill Phillips of Wynnewood, Oklahoma, the man responsible for the rest of the deception. Apparently the state of Oklahoma took him at his word or didn't care that he was creating a document containing false information. At first glance, it looks pretty good. Honest people tend to take other people and the documents they give them at face value – especially if they are governmental records. This is another example of why we need to be more careful. See the Forged Death Certificate page. In July, 1987 a Dalton family researcher (who knew members of the family and lived near them) called Bill Phillips and recorded their conversation. Click here to read the transcription of that taped interview. Neither of them had a headstone, so he placed one for them. Leona's has Bill's fraudulent genealogy on the reverse. 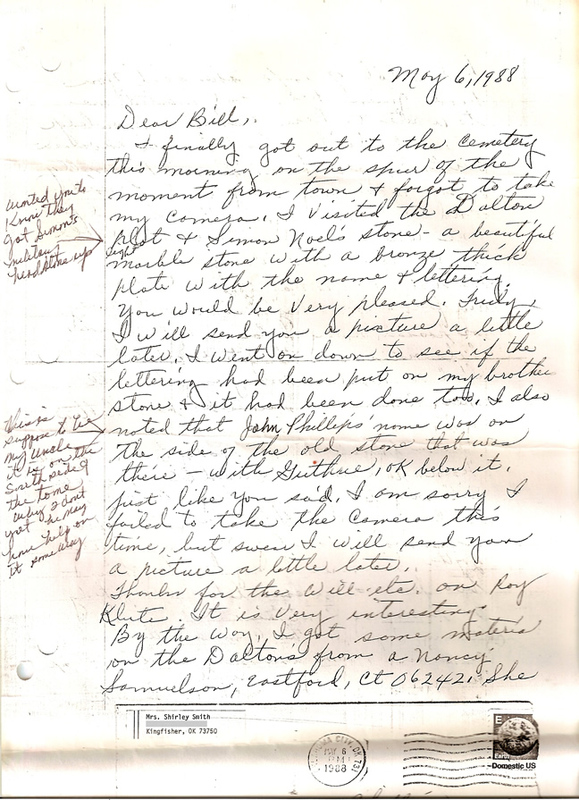 See Bill's letter regarding Leona's grave and headstone. See Bill's letter regarding Simon's grave and headstone. Is it wrong for a non-family member, someone completely unrelated, to place a headstone for another person? Especially when there are living relatives who maybe ought to be contacted and asked for permission? Working every angle to establish himself as an authority on "his" family, Bill donated documents and his own articles to numerous places, spreading his deception far and wide. 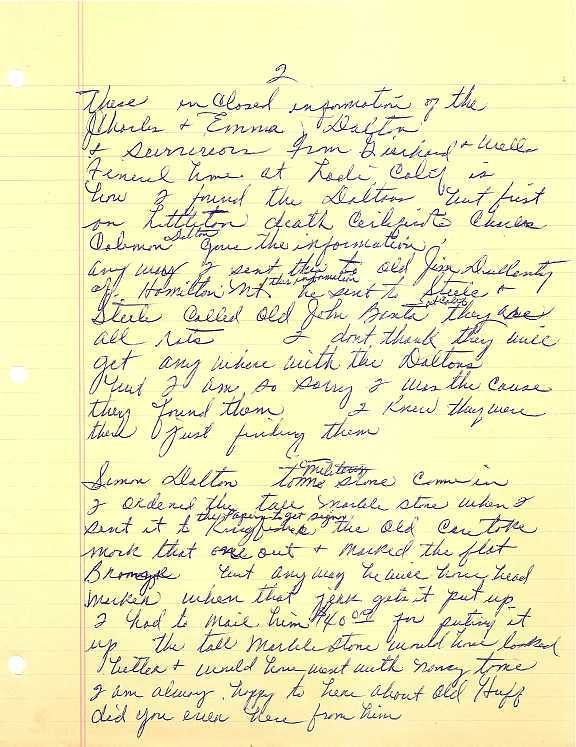 In early 1987 Mark S. Pannill began requesting information from researchers about the Dalton Gang family. Among those he contacted was the person who identified himself as Bill Dalton Phillips and a number of the documents in this exposé came from Bill (e.g. the death certificate and the Bible page). 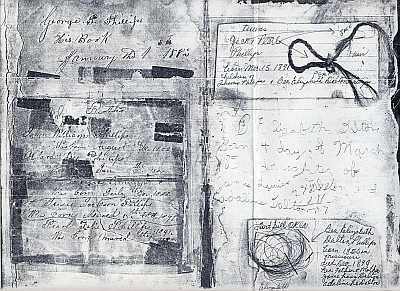 Some of the correspondence Mark received can be seen on the Correspondence page. 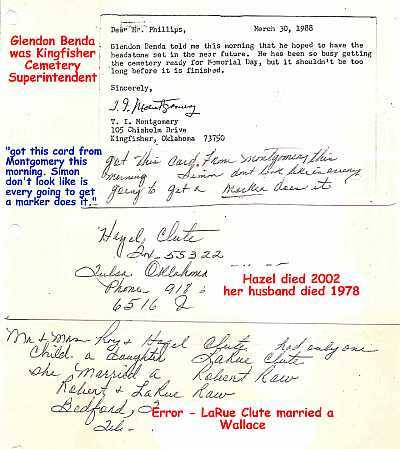 Sometime between the beginning of their accepting paper records (1979) and 1996, someone with the submitter id of "bdphillips2701652" submitted the false information about Bea Elizabeth (Lelia) Dalton. 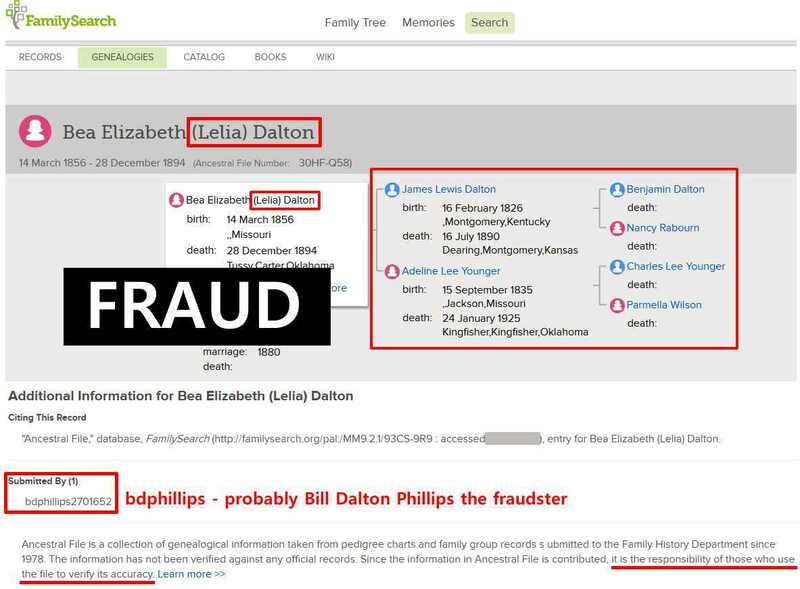 It is Ancestral File Number 30HF-Q58 and is very likely the work of our hoaxster who uses the false name "Bill Dalton Phillips" – "bdphillips". 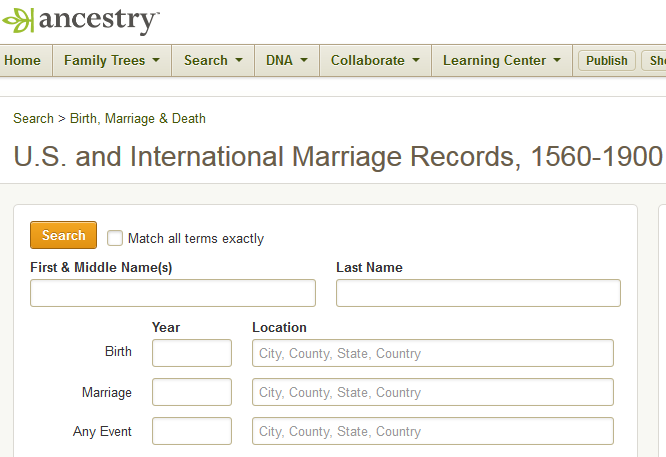 This may be the source of the false information found in the "U.S. and International Marriage Records, 1560-1900" index. 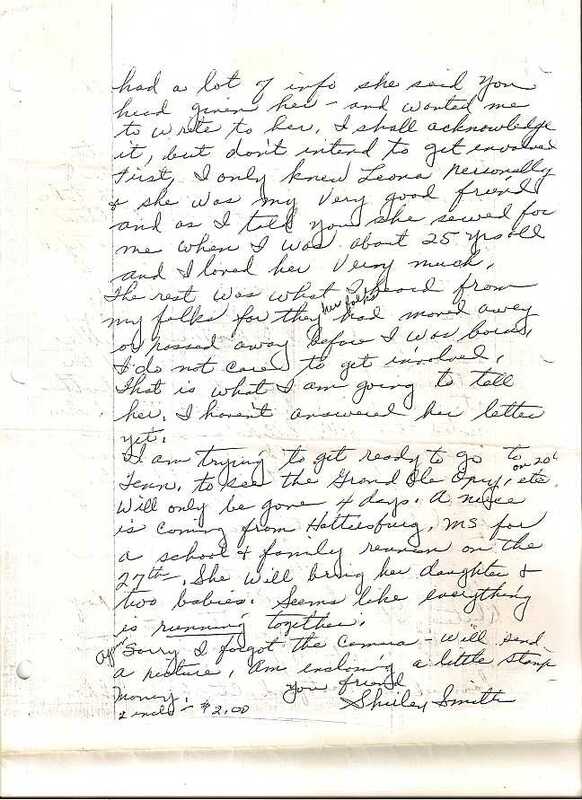 Bill Phillips' letter dated February 20, 1988. 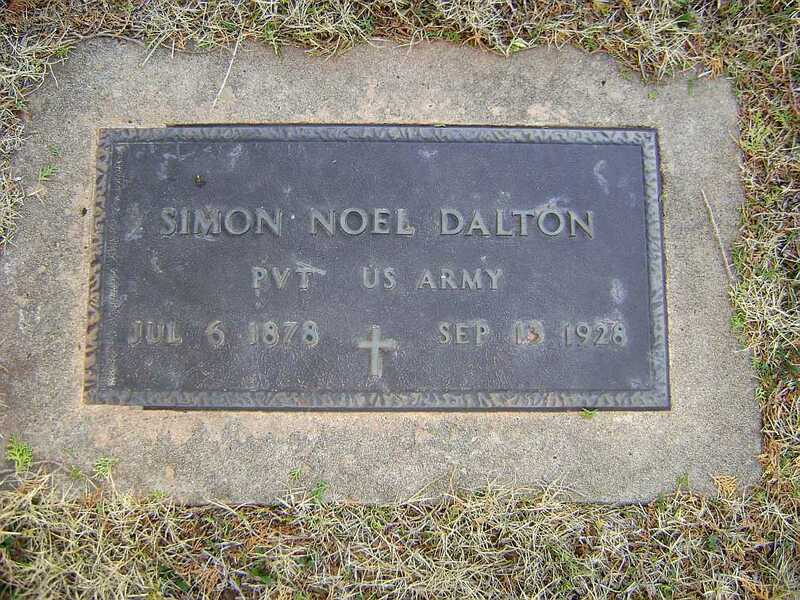 He admits to placing a stone on Simon Dalton's grave – he is not related to Simon Dalton nor did he ever know him. I got Roy Clute military Record Roy died in Tulsa Hospital in 1978 & buried in the Rose Hill Mausoleum I guess they took to Tulsa Hospital but cant figure why he was buried in Tulsa & I don't know if Hazel his wife is still living are not. I will write the Rogers Ark. address. Glendon Benda told me this morning that he hoped to have the headstone set in the near future. He has been so busy getting the cemetery ready for Memorial Day, but it shouldn't be too long before it is finished. Bill writes: "got this card from Montgomery this morning. Simon don't look like is every going to get a marker does it." 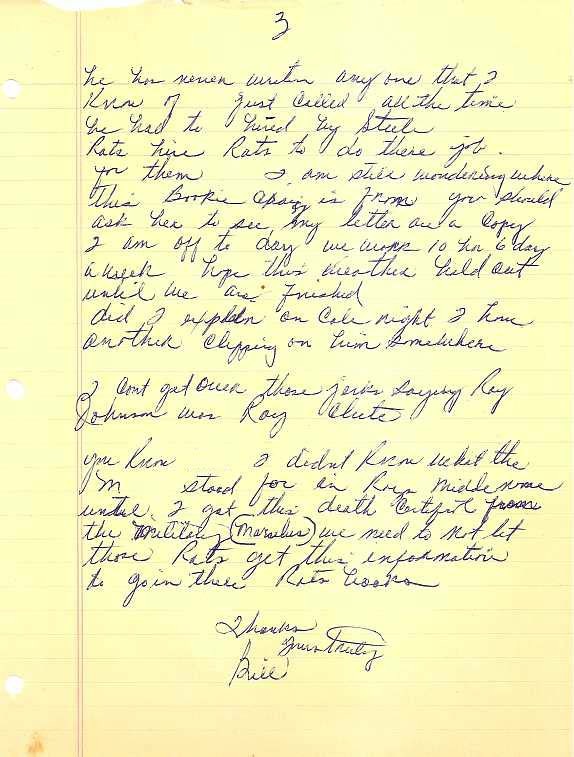 The other notes are his also, but are irrelevant to the exposure of this fraud – other than to provide samples of his handwriting to use in analysis of forged documents. Glendon Benda was the superintendent of the Kingfisher Cemetery. T.I. Montgomery died in 1990. I will send you a picture a little later. I went on down to see if the lettering had been put on my brother stone & it had been done too. I also noted that John Phillips' name was on the side of the old stone that was there – with Guthrie, OK below it, just like you said. This is suppose to be my uncle. It is on the south side of the tome, why I don't get. He may have help on it some way. I am sorry I failed to take the camera this time, but swear I will send you a picture a little later. Thanks for the will etc. on Roy Klute. It is very interesting. had a lot of info she said you had given her – and wanted me to write to her, I shall acknowledge it, but don't intend to get involved first, I only knew Leona personally & she was my very good friend and as I told you she sewed for me when I was about 25 yrs old and I loved her very much. The rest was what I heard from my folks for they her folks had moved away or passed away before I was born, I do not care to get involved, that is what I am going to tell her, I haven't answered her letter yet. Again Sorry I forgot the comma – will send a picture, am enclosing a little stamp money. She informed him Simon Dalton's tombstone had been set. She wrote that the John Phillips whose name is engraved on the reverse side of Nancy Dalton Clute's stone was her uncle. Bill composed this letter and had a friend at his place of work write it for him. My advise to Mr. Steele & his so called researchers to leave the Dalton family researching alone. If we wont any researching done we won't need his help or his helpers (over) calling some of the older Dalton Descendant. Although they might with a fake Hoax genealogy won't work. This is another fraud committed by Bill Phillips. Billy Murl Phillips' sister, Norma, and brother, Jay, died in 1992. Neither of their obituaries mention anything about a DALTON relationship. Billy Murl Phillips' mother, Annie Phillips, died in 1993. There is no mention in her obituary of a DALTON relationship. No sources, dates or places are given for any of the information. 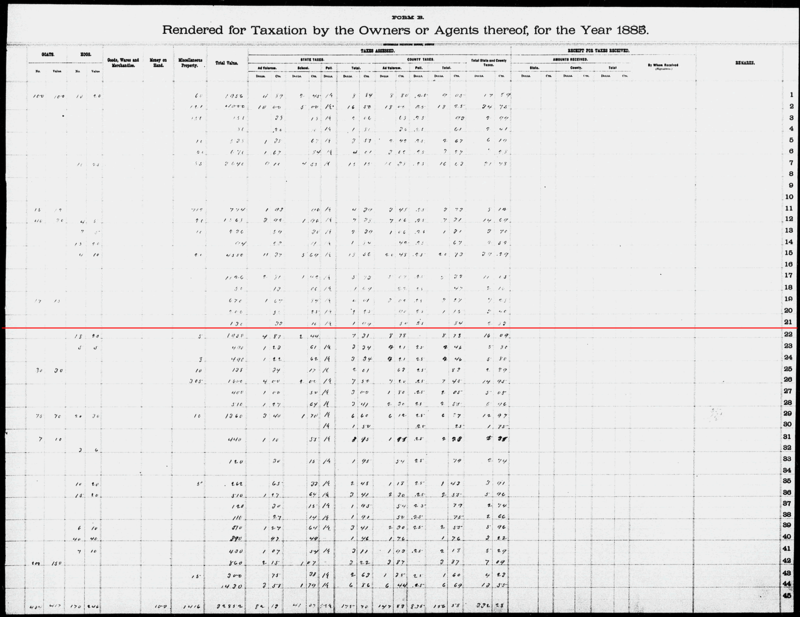 This data is offered to the researcher on ancestry.com in the "U.S. and International Marriage Records, 1560-1900" index. Many take it as a proof but it is offered as a lead or clue only as not all records are sourced. These records come from personal genealogies and Family Group Sheets. There are no sources given. In 1997 Kathy Zamecki of Las Vegas, Nevada submitted the gedcom file RAYBURN.GED to Yates Publishing. It shows Bea Elizabeth (Lelia) Dalton, born March 14, 1856 in Missouri, to be the daughter of James Lewis Dalton and Adeline Lee Younger, that she first married a HARRISON and had an unnamed daughter whose place of death is listed as ",grassfire while,quite young" and second married Tom Louis PHILLIPS and five children for them. No dates or places are given for the marriages. 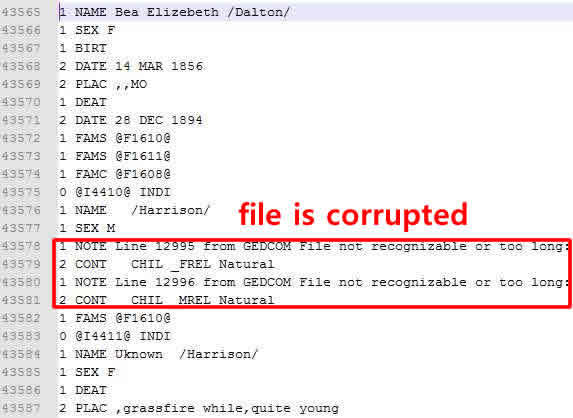 The gedcom is corrupted and the sources don't show up when imported, but a search through the raw gedcom file reveals many sources from the "Broderbund Family Archive" (misspelled in the gedcom as Br-derbund) though there are no sources for Bea Elizebeth DALTON or Tom Louis PHILLIPS. Note there is no gedcom SOUR tag. The gedcom SOUR tag links to a source record, but there are none. The FAMS tag identifies her spouses – family 1610 is the HARRISON marriage and 1611 is the PHILLIPS marriage, but no sources given. The INDI tag (individual 4410) is for the HARRISON man she allegedly married. The INDI tag below it (individual 4411) is for the alleged HARRISON daughter who died "grassfire while,quite young". The FAMC tag (family 1608) identifies her birth family which links back to James Dalton and Adeline Younger but, again, no sources given. In 1998 Sharon Minton Hill of Hot Springs, Arkansas submitted SHARON.GED to Yates Publishing. As with the gedcom above, it is corrupted, but no source records were found in it anywhere. 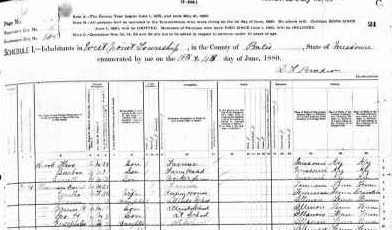 It shows a first marriage to a HARRISON but no date or place. 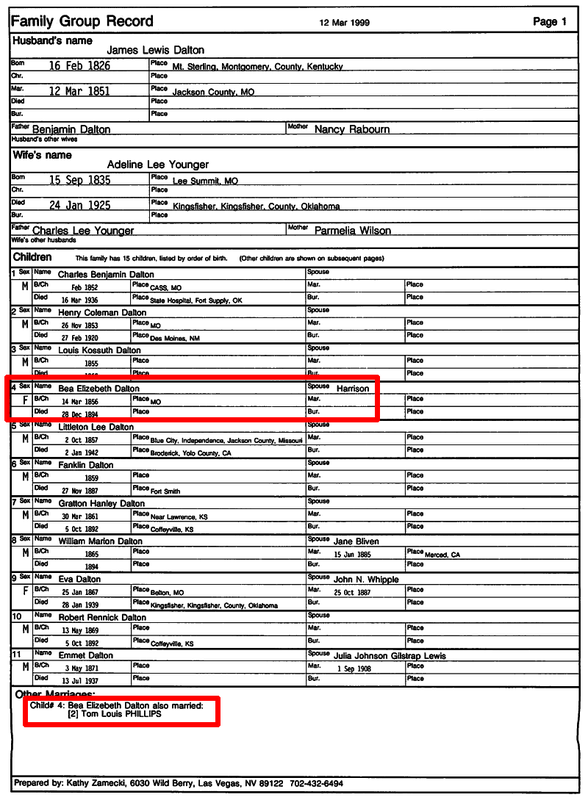 It shows a second marriage to Tom PHILLIPS in Brownsville, Texas, but no marriage date. The FAMS tag identifies her spouses – family 1700 is the HARRISON marriage and 1701 is the PHILLIPS marriage, but no sources given. The FAMC tag (family 1688) identifies her birth family which links back to James Dalton and Adeline Younger but, again, no sources given. 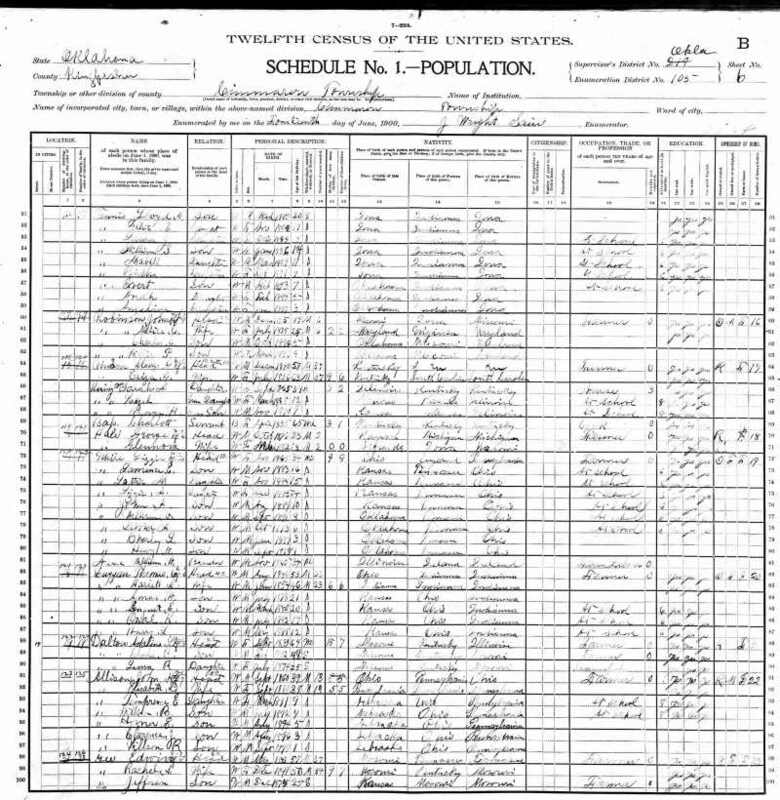 The three entries above, one FGS and two gedcoms, are the sources in the "U.S. and International Marriage Records, 1560-1900" for the marriages of Tom Louis PHILLIPS and Bea Elizabeth DALTON. They are unsourced and therefore cannot and should not be taken seriously. 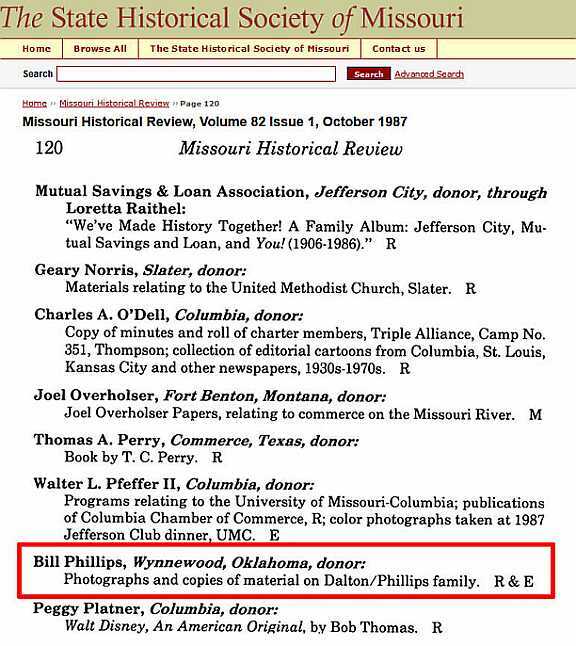 Another source (Billy Murl Phillips aka Bill Dalton Phillips) gives the marriage place of his grandparents as Brownwood, Texas, which is a long way from Brownsville. Another obituary for "Slim" Phillips appeared in the Wynnewood Gazette, Dec. 3, 1998. This one contains a complete family genealogy including his grandmother Bea Elizabeth Dalton Phillips. The man responsible for most, if not all, the deception – Billy Murl Phillips (aka Bill Dalton Phillips) – lives in Wynnewood. Is it unreasonable to assume that Bill wrote this obituary himself? The Wynnewood obituary written (almost assuredly) by his first cousin Bill Phillips. Leona Dalton died in 1964. 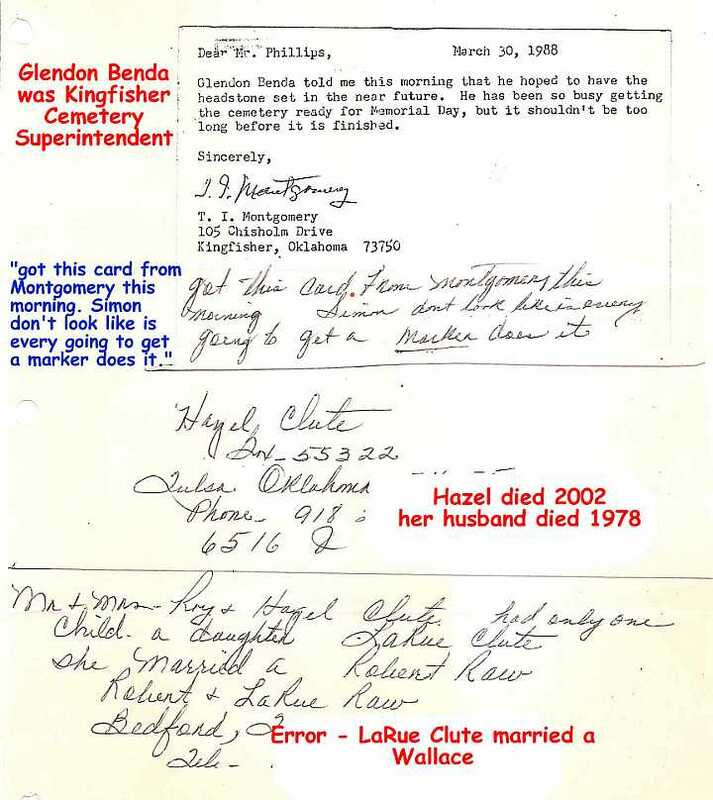 Thirty seven years later, in 2001, the imaginary Bill "Dalton" Phillips sent to the Dalton Genealogical Society a "Memorial Obituary" he created from thin air for the last of the Dalton siblings to die – Leona Dalton. She never married and she cared for her nephew Roy Clute after his parents died. Of course Bill added the name of Jack Phillips, his father, as one of her surviving nephews, thus proving (again) that he is a descendant of James Lewis and Adeline Dalton. Unfortunately for Bill, a "real" obituary exists for Leona -- click here to see it. 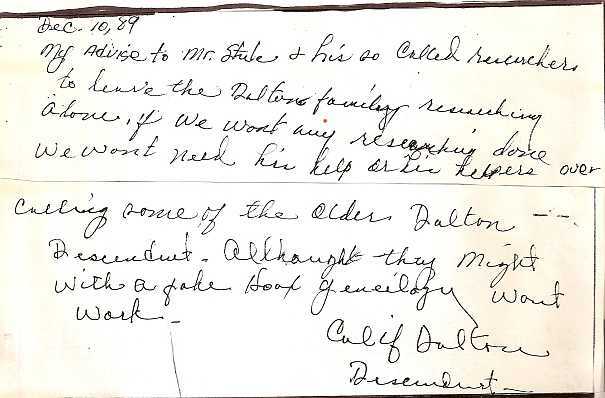 In July of 2004, someone using the fake name "Bill Dalton Phillips" reports to the Dalton Genealogical Society that the head stones for some members of the Dalton family have been "removed" and that he has replaced them. Curiously, the replacement head stones are inscribed with epitaphs alleging that his grandmother, Bea Elizabeth Phillips, was the daughter of James Lewis Dalton and his wife Adeline Lee Younger Dalton. For details see the Tombstone page. Besides the fraudulent additon of his mother "Elizabeth" to the stone, he made two errors on the stone: Louis' middle name was "Kossuth" and the twins were the last two children, Simon and Hannah. In December of 2004, Billy Murl Phillips, again using the false name Bill Dalton Phillips, sent to the Dalton Genealogical Society an obituary for his brother in which is the phrase "grandson of Bea Elizabeth "Lelia" Dalton Phillips and the great grandson of James Lewis and Adaline Lee Younger Dalton". See Daltons in History, Volume 7 No 12, December 2004. Billy J. Phillips, first cousin to Billy Murl Phillips (aka Bill Dalton Phillips), died in 2006. There is no mention of a DALTON relationship in his obituary. Marlene Phillips, niece of Billy Murl Phillips (aka Bill Dalton Phillips), died in 2008. There is no mention of a DALTON relationship in her obituary. Kenneth Keith Phillips, brother of Billy Murl Phillips (aka Bill Dalton Phillips), died in 2013. There is no mention of a DALTON relationship in his obituary. Every time fraud is discovered, the invisible man who calls himself "Bill Dalton Phillips" is responsible. His identity is revealed here.